When starting a business, you can underestimate the power of marketing. No matter your industry, effective marketing strategies are essential for your business to succeed. Without marketing, clients and customers are not going to know about, or be interested, the product or service you’re trying to sell. 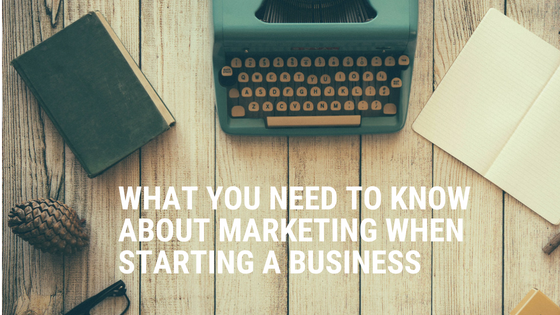 Here are the things you need to know about marketing when starting a business. A unique selling position is a factor that is presented by a seller as the reason that one product or service is different from and better than that of the competition. Part of marketing is figuring out what is unique about what your business offers and how you can leverage this uniqueness in order to market what you’re selling to customers. Marketing 101 is knowing how to make your business stand out. Many businesses can make the initial attempt of trying to do everything well and marketing that they are the best business for all aspects of the market or for all demographics. This is not a wise decision, however, because if you try and be known for everything, you’ll end up not being remembered for anything! Instead, pick an aspect of your business or company, whether it be that you’re targeting a niche market, the product, the mission or values of the brand, and use that as a way of differentiating your company from others that may be similar. Without a USP it can be hard to focus your marketing strategies in a certain direction. When you’re setting up a business, in order to come up with marketing strategies that work, you need to know who you’re going to be targeting. This involves doing market research so you can gather data about the demographics who may be interested in your product or service as this will give you a competitive advantage and allow you to understand what kind of needs those demographics might have. Understanding the market you’re targeting is the only way that you will be able to figure out how to give your customers what they need and in doing so, maximise profits for your business. Conducting research allows you to create a profile of your potential customers based on their spending habits, age, gender and their interests. If you are the type of business with stores or shops in different areas, the demographics or customers you may be dealing with might differ so you may have to consider how location affects the target market. For example, if you’re in the vending machine business you should consider the location of where the vending machine is and the type of people who might be using it in order to understand how to appeal to those groups. A group of high school students looking for an afternoon snack, and a group of professional adults wanting a pick-me-up are going to respond to different forms of marketing. If you’re starting a business in this day and age then you need to understand the importance and the value of engaging with social media for marketing purposes. Almost everyone has some sort of online presence these days and a large proportion of people spend a lot of time online and use social media not only as a way of interacting with friends and family but as a source of news, a search engine and a way of engaging with the outside world. For this reason, there are markets to tap into online that you cannot access any other way than through having a social media presence. This isn’t just about setting up a Facebook page or a Twitter account, social media marketing is about interacting with your customers, solving issues they may have, expanding your network, adding to your brand identity and shaping your company’s reputation. Part of this involves understanding how different social media platforms work and which ones may be best suited to your business. A combination of multiple social media platforms may be best for your company, or alternatively, you may choose to focus on something like Instagram or Youtube if your producing content that is particularly visual. Regularly posting content on your social media accounts is a great way of ensuring you have an online presence and the more interesting, informative or unique the content, the more likely to it is that people will share it with their friends and network. Webinars are a great way of using the internet to connect to people and see the impact of what you’re saying or selling in the moment. They are a great marketing platform and the point of a webinar is to educate and inform those watching. The idea is that you then pitch whatever you are selling at the end. Webinars are a means of showing potential customers or clients your knowledge, your expertise and your investment in the business. For this reason, it helps to build trust and strengthen your relationship with current customers. Living in the digital age has its benefits, and one of those benefits is that there are a lot of online programs, tools and subscription services to help you track, understand and decipher data and analytics and therefore better understand your market and their needs. Tools such as Google Analytics, AHRefs, SEMRush and others can help you understand how your website is doing compared to other websites and allows you to understand the kind of traffic you are getting online. Knowing this information is essential for making future marketing decisions.